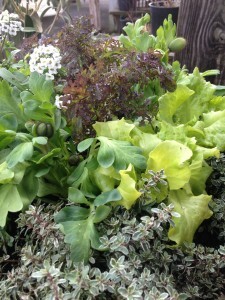 Wondering what to do about your winter-weary container plantings? It’s still too early to put in the real heat lovers, but there is hope. 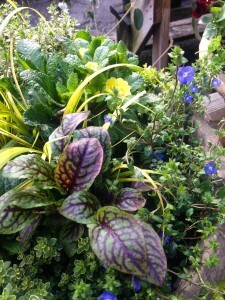 Herbs add so much to container plantings. Whether it be some thyme to trail over the edge or a bit of parsley to add some fluff, they will add texture, color, and scent…not to mention it’s nice to snip a bit here and there for cooking! Take a look at this herb post from last year for more information. While not everything in that post has arrived yet, it will soon; so keep your eyes open! 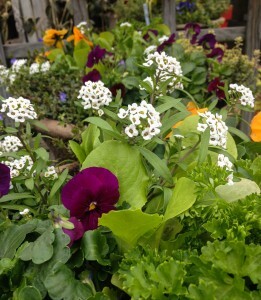 Other great additions this time of year are lettuce and arugula…just in time for spring salads! Plant some now and you’ll be picking until the heat sets in and they “bolt”, or send up blooms. This will mean they’re finished for the season and need to be replaced with something that will withstand the heat of summer. Another really pretty veggie addition is red-veined sorrel…and it’s very cold hardy as well. We even have the first of the geraniums in stock now; they love this late winter, early spring weather. If your pansies survived this winter, they should begin to really blooom for the next month, as well, and snapdragons will even later. When the heat takes it’s toll on these cool season beauties, it will be time to plant your summer combinations. We’re so lucky to be able to have more than one growing season! A caution when using these cool season flowers, however. Be a weather watcher and protect these from any freezing temperatures. If you do this, you’ll have the prettiest planters of anyone on your block! Remember, you can always bring your manageably sized pots in for us to plant! We also carry a good selection of the biodegradable pulp pots that look great on their own or can be dropped into another container. Like to do it yourself? 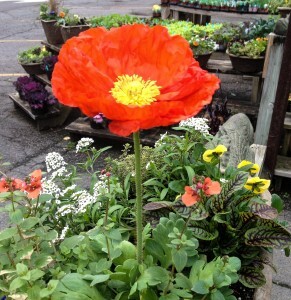 Browse the nursery and collect what you want for your planters, or ask us for help choosing just the right plants. This entry was posted in Annuals, Container, Container Gardening, Flowers, Herbs, Planting Tips and tagged container gardening, cool season annuals, diascia, late winter containers, nemesia, planters, sweet allysum, thyme on March 7, 2014 by Kris Blevons.